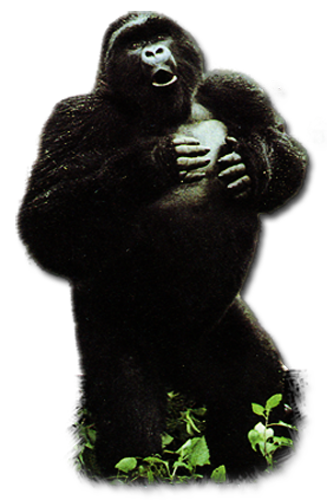 The sexual dimorphism exhibited in Gorilla is large. At over 400 pounds, males are 50% bigger than the females, have pronounced sagittal crests, and massive canines. The most telling feature of sexual dimorphism is the “silverback.” During their mid teens males reach full sexual maturity and begin to develop their signature silver hair. In his prime it will extend from atop the shoulders through the base of the lower back with fringes running through the arms and legs. 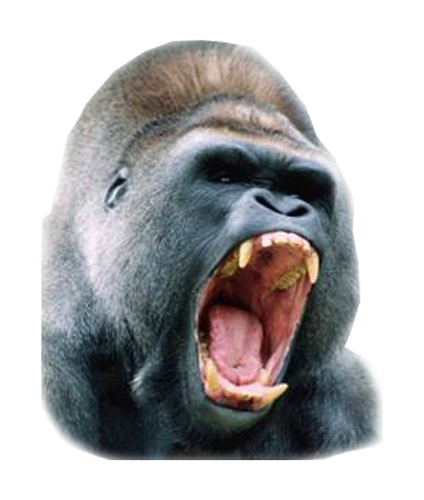 Female gorillas reach sexual maturity at approximately 7 – 8. Sexually receptive females are courted through a series of mock challenges issued by the silverback. These actions typically consist of biting, hooting, barking, chest thumping, and jump kicking. Single infants are born after a gestation period of 8.5 months. The newborn will cling to the chest or stomach of its mother for the first 4-5 months of life and will eventually transition to the shoulders or back. Life expectancy both in the wild and the zoological setting are approximately 40 – 45 years. 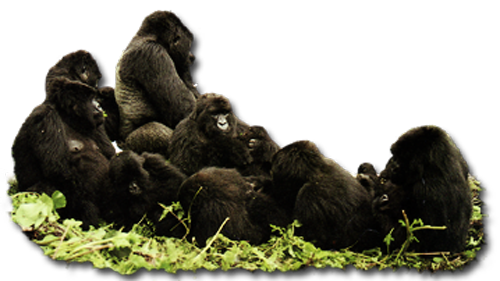 Gorillas typically live in one of two categories of social groups. 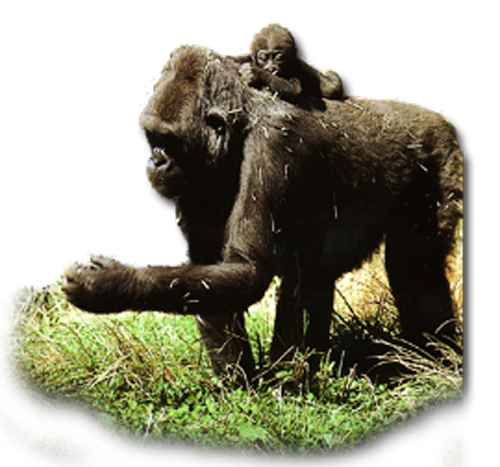 Each of the two systems is composed of 3 – 20 individuals in a strict dominance hierarchy with a mature silverback male at the top. One male polygynous groups occur when one mature male lives with as many females as he can monopolize. It is the responsibility of the silverback to protect the females and his offspring, their food surplus, and territory from outside intruders. Polygynandrous systems contain multiple males and females. 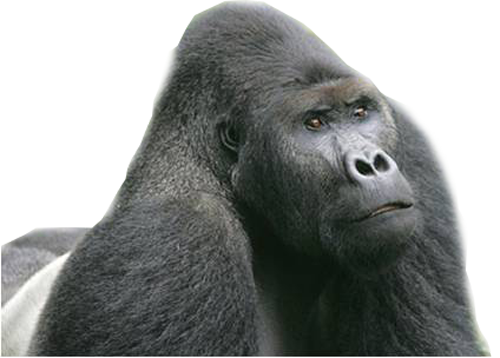 The dominant silverback is aided by the presence of other possible males, most likely his brothers and/or sons, in the group when it comes to the protection of assets. 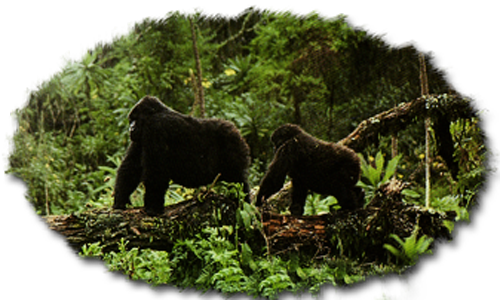 Western lowland gorillas live in lowland tropical forests in Cameroon, the Central African Republic, the Republic of Congo, Equatorial Guinea, Gabon, and Nigeria. This is a polygynous society consisting of one silverback male, multiple females, juveniles, and/or infants. There day consists of grooming, juvenile play, and eating fruits, leaves, termites, and stems. This silverback will sire all of the infants in the group and his reign is absolute. He is under constant pressure to defend his troop at all costs against any challenger. If and when he is deposed it will become the newcomers chance to monopolize and defend both the females and territorial resources. Each of the females has two options: stay and breed or go. A female who is already invested with a child will not become receptive to the new silverback until her offspring are killed. 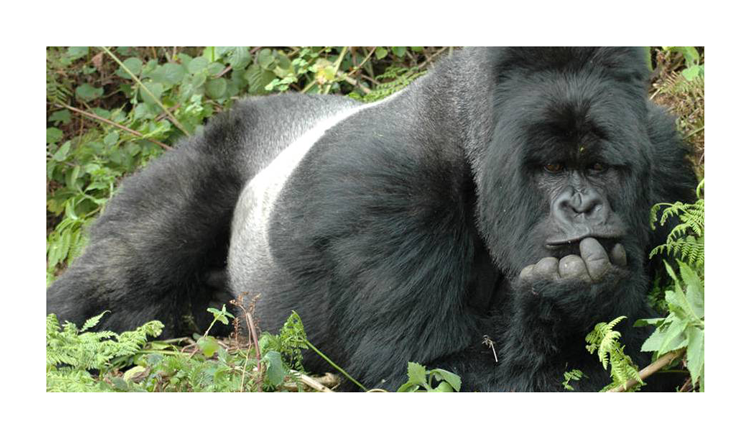 If the new silverback does not complete this task, the mother will lose respect for him and leave for another group. 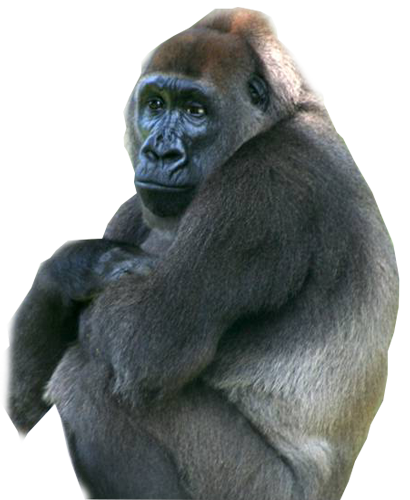 The eastern lowland gorilla is the largest of the four gorilla subspecies. 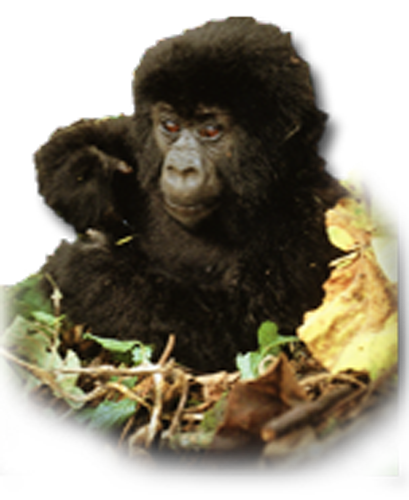 Eastern lowland gorillas, also called Grauer’s gorillas, live in tropical forests from low elevations up to 8,000 feet in the Democratic Republic of the Congo (formerly Zaire) and along the border with Uganda and Rwanda. 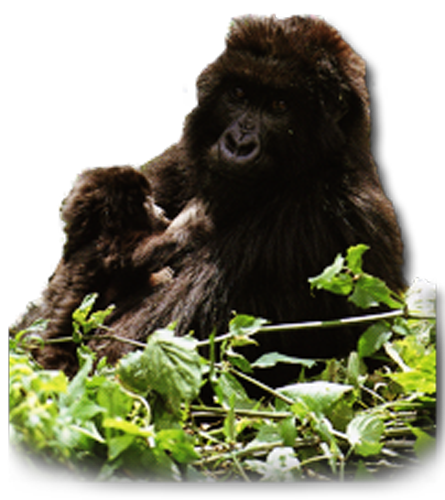 Eastern lowland gorillas feed primarily on leaves, shoots, and stems. Galium vines, wild celery and three or four other species make up a high proportion of the diet. Small amounts of wood, roots, flowers, fruits, and grubs also are eaten. Males of this species either emigrate to form their own group or take over an existing group. 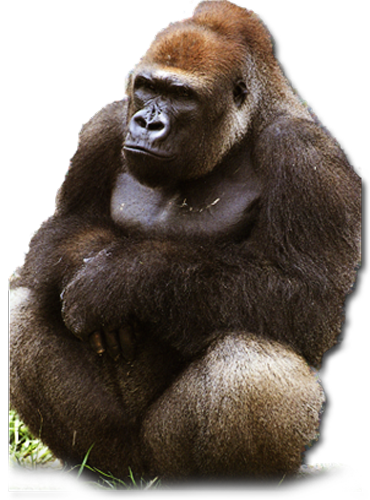 Status: Critically Endangered, the rarest of the Gorilla subspecies with less than 300 individuals. The Cross River State is a coastal state in southeastern Nigeria, bordering Cameroon to the east and it is named for the Cross River (Oyono), which passes it.